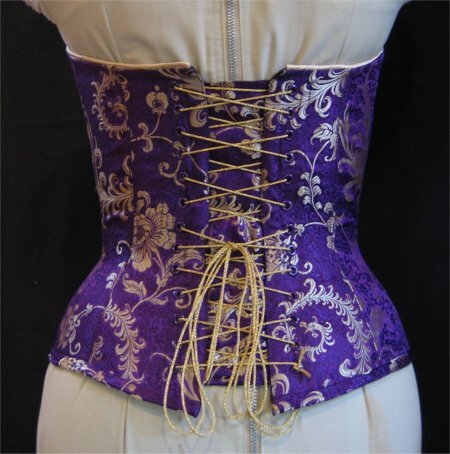 Finally, the corset for Lisa's Senior Ball is done! As this corset is not anticipated to be worn extensively, it was with much expert advice that I decided to make it a two layer corset. One layer of black coutil, to which boning channel tape was stitched. 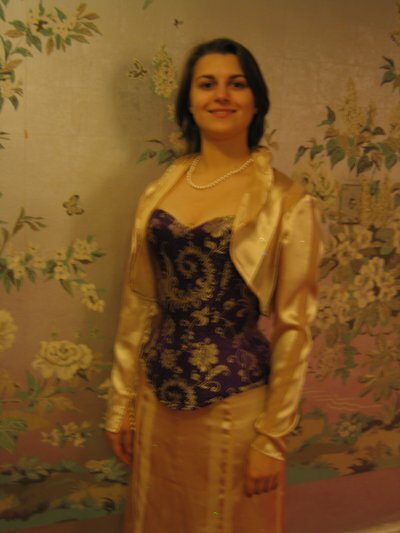 One layer of fashion fabric ... the purple and gold brocade, which was interfaced with woven fusible interfacing. The back section of coutil was extended 2" at the center back, folded over on the center back line so that there were 2 layers of coutil to stitch through to create the back boning channels and through which the grommets could be set. The boning channel tape is sandwiched between the coutil and the fashion fabric. Spring steel is on either side of the grommets to provide support for lacing; spiral steel is everywhere else. Instead of the tradtional binding on the top, I decided to finish it with piping in the fabric that the coordinating skirt will be made. To make the top adjustable, a gold metallic cord was inserted in the piping; this cord can be pulled to snug the top up, if needed. The bottom was finished with a bias binding. Someone (I think it was Tanya in LJ-corsetry?) showed catch-stitching on the inside of one of her corsets. I liked this effect so much, I also put a purely decorative line of catch-stitching in embroidery floss along the bottom binding. You can also see the flossing (described below) in that picture. OH! and talking about floss ... I also put some flossing on the interior (only) to help keep the bones in the channels. It was Tania Gru of LJ-corsetmakers who graciously posted a diagram on how she did her flossing ... I used those directions. Unfortunately, by the time Tania made her post, I had already sewn the coutil layer to the brocade layer and I was NOT about to un-stitch it. So, the flossing isn't as good as it could be, but for a first attempt ... and out of sequence at that ... I'm pleased with it. 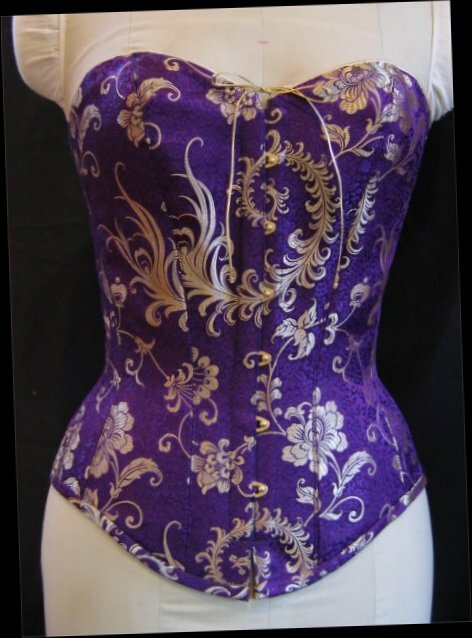 At www.corsetmaking.com, I found a gold stud busk which coordinates beautifully with the gold in the brocade. (A silver stud busk would have looked odd, I think). 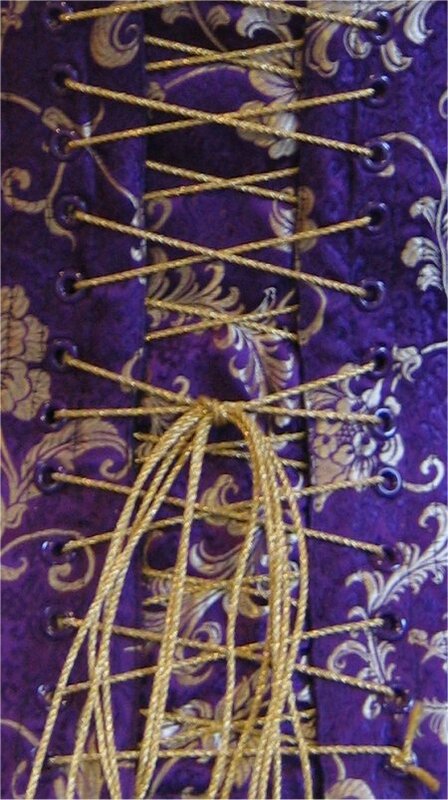 Also at corsetmakers.com, I found glossy purple grommets that EXACTLY matched the purple of the brocade .. boy, do they look wonderful. A modesty panel covers the back gap and is sewn to one side of the corset back; the other side of the modesty panel has a plastic bone in it so it doesn't wrinkle. *I* think that gold for the lacing is the perfect finishing touch and I was pleased to have found narrow, round gold metallic cording at Lacis, my local supply store . It's much stiffer than regular lacing but not too stiff to tie off ... I don't think the knots will un-do themselves. Here's the picture of the purple grommets and gold lacing. I was very, very, VERY pleased that I was able to match the brocade pattern across the center front. The back of the corset can be seen in this picture. Next project: the skirt and shrug! Lisa really likes the look of gored skirts or skirts with godets. I found Vogue V7824, a dress pattern, that had the perfect skirt. 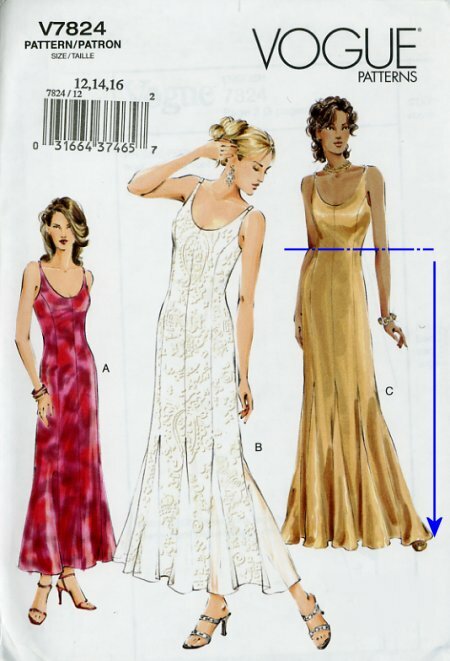 It's an easy matter to modify the dress pattern to eliminate the bodice and use the skirt part as a stand-alone skirt, as shown by the blue line & arrow in the picture. Lisa chose a lovely gold tone-on-tone sheer striped fabric that will lend itself beautifully to this skirt. I was surprised to see that the straight panels that make up the skirt were lined to the edge of the godet, leaving the godet itself unlined. This meant that the lining needed to be *hand stitched* to the seam line of the skirt panel and the godets! Not difficult but sure did take up the major part of an evening. Thank goodness there were a lot of interesting programs on TV that night! The shrug is from Simplicity 4270, a 1930's retro inspired pattern. Lisa chose the long sleeved shrug, as shown in the white sample in the picture, which will be made from the skirt fabric. The pattern calls for the shrug to be completely lined to the edge so that the interior is beautifully finished. However, since the skirt fabric is that lovely sheer, we decided that a lining would spoil the effect. Fortunately, the fabric was so wide that I was able to merge the shrug front and back sections at the side seam, to eliminate it. 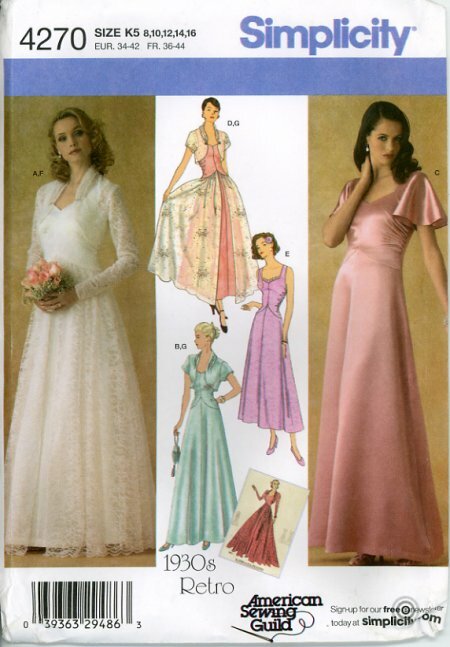 The sleeves were finished with French seams. Because of the way the front pattern also contained the back neck collar, I couldn't do French seams where the front joined the back at the shoulder seams .... so I did mock French seams. Not necessarily difficult but sure did soak up a LOT of time. That left the outer edge to be finished. I didn't want to do a machine stitched narrow hem, as the combination of my technique, sewing machine and narrow hem foot don't really handle curves well. So ... that left exactly one solution: another hand-rolled hem. OMG .. talk about time consuming! Am I glutton for punishment or what? The sleeves of the shrug have a very nice button and loop detailing. Lisa also is very, very talented at knitting. 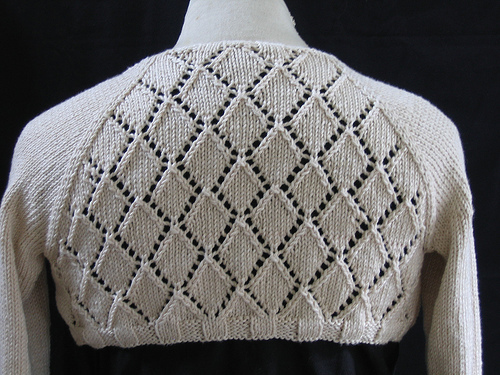 As an alternative to the fabric shrug, she made herself a knit lace shrug in a neutral ecru color. The details, per Lisa: Pattern: "Shimmer" from knitty.com, Yarn: KnitPicks Shine Worsted, Needles: US 8. Don't ask me what any of that means; I don't knit. So, where are the pictures of the complete outfit being modeled?? Why right here!